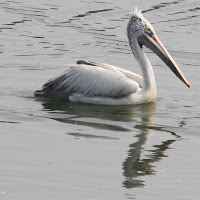 The Vedanthangal Bird Sanctuary, which is located about 75 kilometres south of Chennai (Madras), is a nice place to spend half-a-day with nature. The best time of year to visit this birds paradise is November-February. Many migratory birds arrive during the winter from northern lands. 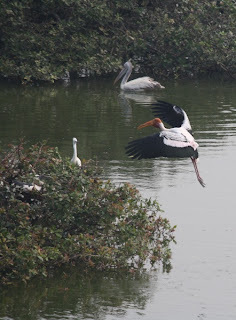 Painted Stork, flying from right to left before it landed in its nest. Abundance of painted storks are seen in this sanctuary. The bird sanctuary is about 12 kilometres off the national highway 45 that connects Chennai to Tiruchirappalli (Trichy). The road to Vedanthangal branches off before the town of Madurantakam, when driving down from Chennai to Villupuram on NH 45. The lake where the variety of birds build their homes during winter is protected by a bund. A watchtower and some viewing areas cover the nearly 1 kilometre long path along one side of the lake. This place is a bird watcher's paradise. An amateur could also learn a lot about two dozen different birds, through the information posted along the lake. The entry tickets are only rupees 5, while tickets for camera and video camera cost rupees 25 and 150 respectively. The whole path and viewing areas are well maintained. The crew maintain a coin-controlled binocular which allows visitors to take a close-up view of the lake, bushes & birds at close quarters. Some of the amazing things to experience in this place is total integration with nature, where only the bird sounds are heard in abundance. There is no noise pollution from vehicles or other man-made machines, which makes the place so peaceful to relax at. A relaxed walk along the perimeter of the lake, with stops to observe the nests & some games, flights and fishing by the birds, etc., would take at least a couple of hours. With the advent of modern technology, one can record pictures and video of this place to later enjoy the scene again at leisure at home. The best times to see most birds are early morning and the evenings. That is when the birds return to the nests. If one were to visit during day-time, there are still 1000s of birds (yes, thousands) in that half square kilometre area, which itself looks abundant. 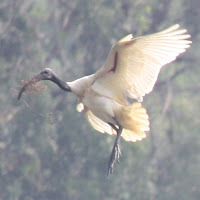 There is another sanctuaries close by, which are better visited only during early mornings / evenings. It is called 'Karikili' and is about 4-5 kilometres from Vedanthangal. Enjoy a winter visit to this place and one longs for more time to be spent with nature. PS: And we hope that you do not spare the rod and spoil the monkey (Dunston Checks In), if you know what I mean, by what is shown below. With abundance of greenery all around, Vedanthangal Bird Sanctuary is a paradise for nature lovers in its truest sense. If you are planning a trip to Kanchipuram, check out these popular hotels in Kanchipuram.